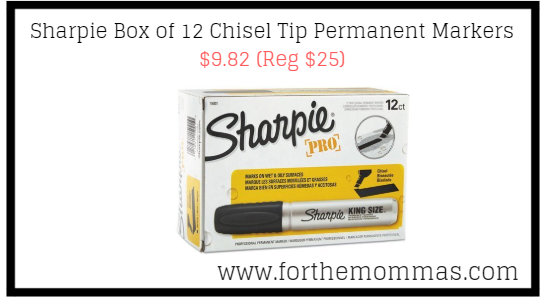 Amazon has Sharpie Box of 12 Sharpie Pro King Size Chisel Tip Permanent Markers for $9.82 (Reg $25) with FREE Shipping on orders over $25.00 or with Amazon Prime Orders. Water-resistant and quick drying, the Sharpie King Size writes well on most surfaces, including wet or oily surfaces. The extra-large supply of industrial ink ensures that you can tackle big projects without worrying about running dry.